"Music condemns me to live." Abel Gance is best known as the auteur of the epochal 1927 film biography of Napoleon, restored some years ago and re-released to significant success. Gance felt at liberty there to play fast and loose with history, and he does so again with his 1936 biopic on composer Ludwig van Beethoven (well-played by Harry Baur). Gance covers much of the same territory that was more recently covered by Immortal Beloved. The central issues are the progress of his deafness, his despair and final defiance, and the mystery of the "Immortal Beloved," the unknown addressee of a passionate love letter which was found after Beethoven's death. The deafness portions of the film are the clear highlight. Gance uses his camera in varied shots and manipulates the sound to give both the torment of an incessant buzzing racket in the ears alternated with utter silence, when the film works from Beethoven's narrative standpoint. When the view of outsiders is taken, then the soundtrack returns to normal. Gance and Baur unite to present an incredibly moving picture of the artist who fears his art will be taken away from him. In an interesting sequence, Beethoven begins to recollect sounds he has heard, which pour forth in a torrent of cacophony which eventually resolves into the relaxed and jaunty opening theme of the Pastoral Symphony. Wordlessly, Gance gives us a picture of Beethoven's resolve to live and to continue to create that is tremendously effective. The other thread is a contrived and historically inaccurate love triangle between Beethoven, Countess Juliette Guicciardi (Jany Holt) and Therese von Brunswick (a radiant Annie DuCaux). While this makes for romantic drama, it isn't carried off terribly well. Guicciardi comes off as obviously shallow and self-centered, and von Brunswick as a completely self-sacrificing martyr, a characterization emphasized by Gance's penchant for encircling her face in a halo. They seem to be mere caricatures, rather than real people. Perhaps my resentment at the fabrications is coloring my opinion here, but the love story just doesn't work. Harry Baur gives a first-rate performance throughout, but is obviously about 25 years too old to be playing the thirty-year-old Beethoven. The pathos of the composer's incipient deafness would have been even greater had he been played by a younger man, still just barely begun on his career. The deafness proceeds much too quickly in the film, almost immediately becoming total, but I can accept this as a storytelling necessity for a two-hour running time. The historic inaccuracies are too numerous to list; some of them are simply ridiculous and unnecessary to the story and are indicative of biographical sloppiness. For instance, in a sequence set in 1807, oblique reference is made to Beethoven's still-unfinished Eroica symphony. However, that symphony was completed and performed in 1803. His last illness is described in a title as beginning in late February of 1827, but he had been more or less bed-ridden since December of 1826. None of these are important to plot points or the drama, but are just outright misrepresentations to no good purpose. Other misrepresentations that are included for dramatic purposes are Beethoven naming the Sonata op. 27 nr. 2 the "Moonlight" Sonata (it was given that nickname years after Beethoven's death) and bribing an organist at Guicciardi's wedding to play the funeral march from the sonata op. 26 in place of a wedding march (a fabrication from beginning to end). 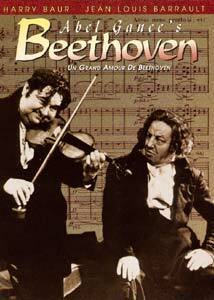 The film depicts Beethoven as so impoverished at times that he is reduced to stealing beer; although he tended to complain about insufficient funds, Beethoven was never so poor, and there is no evidence for such a claim. There is also a scurrilous and completely baseless implication that Guicciardi may have had an affair with Beethoven's nephew, Karl. Probably the strangest and most disorienting effect in the film is the tendency for Beethoven to sit down to the piano and begin to play, while the sound coming out of the speakers is that of an orchestra. This effect is extremely disturbing the first few times, but becomes more acceptable as the film goes on. In all, this is a deeply flawed portrait of the composer, but it also, particularly in the deafness sequences, is a deeply moving portrait as well. Image Transfer Review: This DVD is apparently a reissue of a 1990 laserdisc version of the film. Unfortunately, the image is extremely poor. There are numerous instances of abrupt jumps indicative of missing frames, and a highly irritating tendency for the picture to rattle from side to side shortly after any cut. At times, this can be painful to watch. Several early scenes seem to be badly cropped, since there are a number of heads cut in two on the sides. One gets the definite feeling that the technicians doing the transfer put the film on and let it run without paying any particular attention to it. There is plenty of frame damage and speckling throughout the film. While the blacks tend to be good, certain sequences are overly contrasted to the point that detail is completely lost. The picture tends to be smeary and is largely unsatisfactory. If this is the best print available, then this is a film in desperate need of major restoration work. Audio Transfer Review: Unfortunately, the audio is just as bad as the image. The music is tinny and crackly throughout and the dialogue is nearly buried in hiss and noise. Since I don't understand French and have to rely on the subtitles, this wasn't a huge issue for me, but I expect French speakers will have difficulty in following the dialogue. The poor quality of the music reproduction is a far bigger failing on this film. The music is beautiful and is given a solid performance, but it's extremely hard to listen to on this disc. Extras Review: Just about zippo. The chaptering is quite inadequate (chapter 7 runs for over 25 minutes). On the positive side, the subtitles are yellow, allowing them to be seen easily. The subtitles are removable, to allow view of the lower portion of the picture, which is far preferable to being burned-in. But that's about it. No production notes, no trailer, nothing. A highly disappointing disc of a historically inaccurate but often quite moving classic film. The curious may want to rent it, but I can't recommend a purchase in light of the abysmal condition of the source materials and absence of any extras at all. Mark Zimmer is the Project Director of The Unheard Beethoven, a nonprofit website dedicated to making unknown and unrecorded Beethoven music available to the public.